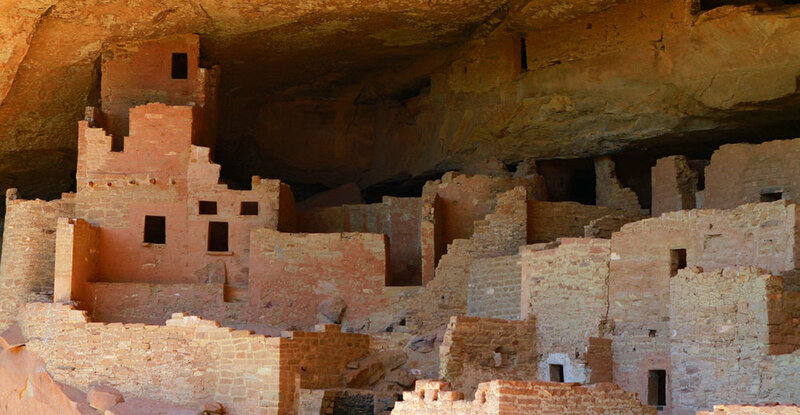 Discover eons of history in Colorado and Utah. What secrets lay buried in the Earth? The summer sun sits high on this cloudless day, the light shimmering off the distant hills. You've watched the exotic landscape roll by as you head to the next park, each destination more enigmatic than the last. You arrive and sprint off the bus, almost tripping over yourself in excitement. You've seen the fossils and reconstructed skeletons of the ancient beasts in the museums. Now it's time to see their graveyard. Some catastrophe befell these monsters tens of millions of years ago. And here, their bones turned to rock, you can finally see their half-buried remains for yourself. Your sense of time stretches beyond the confines of your life - and indeed all of history. You can feel the eons piled upon eons, each geologic era exposed for counting, measuring, and understanding. You find yourself a part of the great rhythms and cycles of life on this planet. The closest you've ever felt to traveling through time. "The surreal landscapes and fossils of Colorado and Utah offer one of the world's richest windows into our natural history. These rocks reveal how our own stories began millions of years ago. I am both humbled and inspired by these places every time, and I love sharing that experience with others." Please note: Itinerary and hotel selection are subject to change due to weather and other factors beyond our control. Double occupancy. Limited single occupancy rooms available; surcharges apply. Flights are not included. This tour will book quickly. Reserve your spot with a deposit of $300. Begin your reservation by submitting this form so our travel agents can contact you, or you can immediately register online. You can also talk to our agents directly by calling 740.407.2157 and asking for the "Deep Time Fossil Trek" tour. In order to develop custom tours with our partners, we have to secure our group accommodations and transportation with a minimum number of guest reservations. Rest assured, if the tour is dropped, everyone who made their deposits and payments through AstroTours will be notified and fully refunded. Details on customer cancellation policies are in our Terms & Conditions below. You’ll also be invited to attend a live webinar with your science storyteller and our staff to get updates, share travel tips, and ask questions. Tour logistics provided by Premiere World Discovery. Travel agency support provided by Mermaid Travel. We are all explorers – on a journey of discovery, sharing in the natural wonder of our planet and the Universe, and seeking extraordinary science experiences together. We are committed to and actively promote diversity in our community, and we believe the future of science and research, culture and art, depend upon the inclusion of and respect for individual perspectives. We will always be considerate, kind, constructive, and helpful with each other, and promote a collaborative environment of safety, security, and friendship within our community. We prohibit the use of any demeaning, discriminatory, threatening, or harassing speech toward any member of our AstroTouring community. Your participation is contingent on upholding these ethics and standards of integrity as we travel together in search of our own unique connections with the cosmos. A deposit of $300 per person is due upon reservation. Final Payment due 75 days before departure. Once deposited, you have 7 days to send us written consumer consent or withdraw consent and receive a full refund. Cancellation protection is highly recommended and must be purchased at time of deposit. Payment of a per person waiver fee guarantees a full refund of all payments (including deposit) except for the waiver fee itself, in case of cancellation of travel plans for any reason prior to the day of departure. Any name changes are subject to penalty. A handling fee of $25 per change will be assessed for any change or revision made to a reservation. Six months prior to departure a non-refundable deposit will be retained. For cancellation between 74-45 days prior to departure: cancellation fee of 25% of total price. For cancellation between 44-15 days prior to departure: cancellation fee of 50% of total price. For cancellation after 14 days prior to departure: 100% of total price. The Travel Protection Plan Fee does not cover any single supplement charges which arise from an individual’s traveling companion electing to cancel for any reason prior to departure. AstroTours reserves the right to cancel any reservation, and that person will be responsible for any cancellation fees that apply, if our CODE OF ETHICS for the Astrotouring community are not upheld and adhered to. and Spacetime Creative Labs LLC. Agency support provided by Mermaid Travel. AstroTours is registered with the State of Florida as a Seller of Travel. Registration No. ST41371. Our license to sell travel to residents of Hawaii is still pending. Please contact our travel agent to help you with tour reservation options.